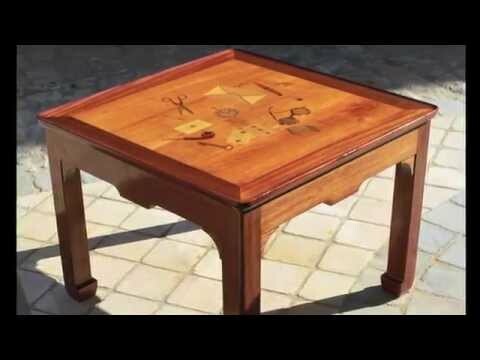 Extremely rare square wooden coffee table with inlaid design depicting scissors, cigar, pencil, envelope, pipes, a pair of tortoiseshell glasses, a box of matches, a match, a pocket watch, cards and a key. The inlay of the pair of tortoiseshell glasses is probably inspired by the artist's actual pair, as we see him wearing these glasses in a photo taken by Sabine Weiss in 1954. The table consists of a marquetry panel mounted on table feet, designed circa 1930 inspired by a drawing by Foujita. It is signed on the lower left portion of the surface. Most likely made in France. Literature: S. Buisson, Leonard Tsuguharu FOUJITA: sa vie, son oeuvre, Paris, 2001, vol. II, p. 304, no. 30.119 (illustrated). -A model of this table was exhibited in Paris from June 2004 to September 2004 at the Musée du Montparnasse during an exhibition consecrated to Leonard Tsuguharu FOUJITA and titled "Musée du Montparnasse, FOUJITA, le Maitre de Montparnasse", ( Montparnasse Museum, FOUJITA, the Master of Montparnasse ). - A model of this table was exhibited in Paris from November 2007 to January 2008 for the 40th anniversary of Leonard Tsuguharu FOUJITA's death, shown in the catalog under the reference number 28. Condition: Excellent original condition. Not repaired, not refinished. Some marks on the varnish and on the wood due to the age. Measurements: H.20 7/8" x W.28 1/8" x D.28 1/8"